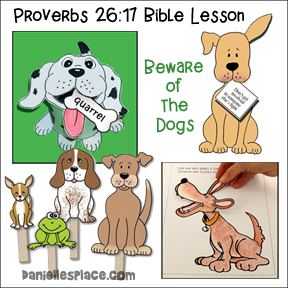 The ideas for these Cain and Abel crafts and activities come from the printable Sunday lesson on The Resource Room, a members-only section of Danielle's Place. 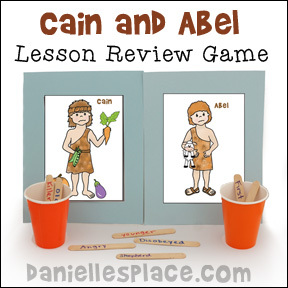 In this lesson children learn about Cain and Abel, and how Cain made the wrong choice. They learn that sin separates us from God. Sin requires punishment, but God is a kind and loving God and forgives us, and restores our relationship with him if we confess our sins and ask for forgiveness. 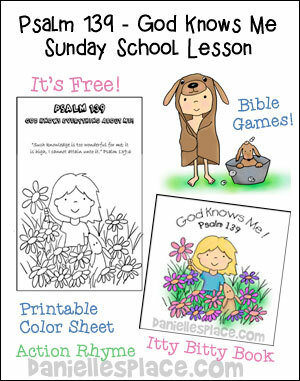 Included in this lesson is the printable Bible Verse coloring sheet pictured to the right. The Bible verse is 1 John 1:9. 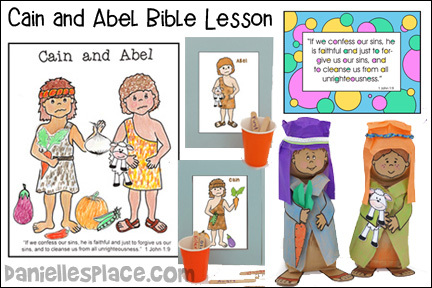 Children color the pictures of Cain and Abel and then glue pictures to the page in the appropriate place. To make this activity easier, children can draw pictures instead of gluing pictures to the sheet. As your children work talk about the differences between them and their brothers and sisters, jealousy, doing the right thing, and forgiveness. This lesson is great. Thank you for putting together such a good lesson. I am starting at the beginning of the Bible and going to end, teaching our 1st - 6th graders in our Wednesday night programs. I work full time and am so glad I found your site. It is so great that someone has done the work for me (and is very biblical based) and all I have to do is teach. Thanks again. 1. Place a rock or something heavy at the bottom of a brown lunch bag. Place a paint stick or other support such as card board inside the bag so it is sticking out the top. 2. Stuff the bag with plastic grocery bags. Gather the top of the bag around the paint stick or support and glue it to the paint stick or support. 3. Cut the edges off around the two paper bowls, leaving just enough edge to glue the two paper bowls together. Glue a bowl to one side of the bag and support and then glue another paper bowl to the other bowl top to top. Paint the bowl flesh color. 4. Draw a face on the bowl or use the printable patterns and glue one to the bowl. 5. Cut the front out of a colored gift bag to make the head covering as shown in the picture. Place the bag on the paper bowl head and glue it down. Tie a ribbon or material around the head covering. 6. To make the cloak cut another brown down the side to the bottom of the bag and then cut off the bottom so that you have flat piece of paper. 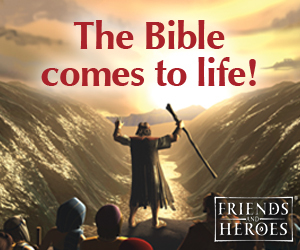 Color the bag and then wrap it around the Bible character's body as shown in the picture. Fold down the corners to make the collar and glue it to the body. 7. Draw arms and feet on cards stock (Printable patterns are available to members), color them, cut them out, and glue them to the body as shown in the picture. 8. To finish draw a sheep, a carrot of other vegetables, color them and cut them out and glue them to the arms. Younger children will enjoy this activity sheet. They glue small pictures to the hands of Cain and Abel and then color the sheet. 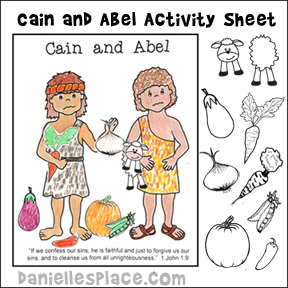 This activity sheet goes along with the Cain and Abel Bible Lesson on The Resource Room. 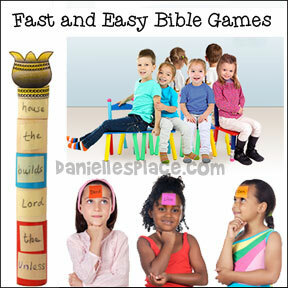 Place your children in groups of three and have each group practice making a skit about Cain and Abel and then have all the groups perform their skits in front of the class. If possible record the skits and replay them in class. 1. 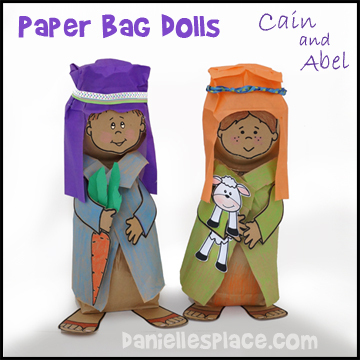 Print out the Cain Patterns and Abel Patterns, cut them out, and glue them to card stock. Make a set of pictures for each team. 2. In class divide your children up into two teams and place the bowl with the craft sticks in the middle of the two teams just before the start line. 3. Place cups and the pictures of Cain and Abel at the opposite end of the room across from each team. Place a cup in front of each picture. 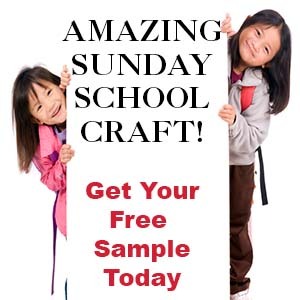 Children take turns picking up a craft stick, reading it, and then running to the other side of the room, and dropping the craft stick in the appropriate cup. When the bowl is empty the game is over. The team that has the most correct craft sticks in the cups wins. 1. Place all the craft sticks in a bowl. Let your children take turns picking a craft stick. Read the words craft stick and let the child decide in which cup he or she should place the stick. When all the craft sticks are in the cups, take one out at a time, read it, and ask your children if it is in the correct cup.